The patron saint of brewers is usually given as St Arnold of Flanders or his near-namesake St Arnould, bishop of Metz. But English brewers have their own (unofficial) saint: Thomas Becket, the Archbishop of Canterbury assassinated in the 12th century in his own cathedral by four knights acting on the supposed instructions of King Henry II. Thomas was born in or about 1118 – quite probably on December 21, St Thomas the Apostle’s Day – in a house in Cheapside, London, between streets that are today called Ironmonger Lane and Old Jewry. His father, Gilbert, a wealthy former merchant and property owner, was born in the village of Thierville in Normandy. Whether Becket was the family name, or a nickname given to Thomas, sources disagree: in his own lifetime Thomas called himself “Thomas of London”. (The style Thomas à Becket, incidentally, seems not to have been used until after the Reformation). In 1139 Theobald of Bec, who was also from the Thierville area, became Archbishop of Canterbury, and his patronage undoubtedly helped the young Thomas of London. However, the 13th century historian Matthew Paris, a monk at St Alban’s Abbey in Hertfordshire, said Thomas was given his first post in the Church by the Abbot of St Alban’s, Geoffrey de Gorron (or Gorham). Geoffrey supposedly made the young Thomas the priest at St Andrew’s church, Bramfield, a small village about five miles north of Hertford, an appointment some historians say took place in or around 1142. While at Bramfield, its village historians claim, Thomas brewed ale using water from the old vicarage pond. This was described in the 19th century as “a little bricked-in muddy pond in the vicarage farmyard”, and it is still known as Becket’s pool or Becket’s pond. If this sounds unhygenic (particularly as tradition also says Becket and his monks used to wash in the pool), using pond water to brew ale and beer was a very common practice. The farmer-diarist John Carrington, whose son ran the Rose and Crown at the nearby village of Tewin, took water from his farm pond at Bramfield to make his harvest ale with as late as 1800. The village clerics also drank home-brewed ale for hundreds of years – one history of Bramfield says the vicar still brewed his own beer until the 19th century. Unfortunately for Bramfield, other sources put Thomas as a student in Paris from the mid-1130s or so until around 1140 or 1142, not in Hertfordshire. After that, it is said, he was then working in London as a clerk for a kinsman with the wonderful name of Osbert Huitdeniers, or Eightpence. Osbert seems to have been what passed in the 12th century as a banker. By 1146 Thomas had won a place in the household of Archbishop Theobald as a clerk, presumably through his father Gilbert’s Thierville connections (Gilbert had apparently, by this time, lost all his wealth, possibly in a fire). As evidence in favour of the Bramfield connection, however,, shortly before Thomas was killed in the cathedral at Canterbury, he is said to have reminded the then Abbot of St Alban’s that it was his monastery that gave the Londoner his first “honour”, the “ecclesiola” (“little church)” at Bramfield, when he was young and poor. It is quite possible Thomas was given the appointment, and with it the priestly income, when he was working for Theobald, but a deputy stood in for him to perform the actual duties of the priest at Bramfield. On the other hand, after Thomas’s assassination, when he was made a saint, a Saxon well at Bramfield church was renamed the Holy Well of St Thomas, and attracted pilgrims for its reputed healing powers, again suggesting a close connection between the saint and the village. In 1154, after six or more years in Theobald’s service, Thomas was appointed by the Archbishop as Archdeacon of Canterbury, a post worth around £100 a year. This was a substantial sum in 12th century England and showed that Thomas, now in his mid-30s, was highly regarded by the Archbishop. His new post did not last long, and he had clearly impressed the right people: just a few months later the newly crowned Henry II, then only 21,pulled Thomas from the Archbishop’s staff and made him Chancellor, one of the most powerful positions in the kingdom. For eight years Henry and Thomas worked together, developing a close friendship. 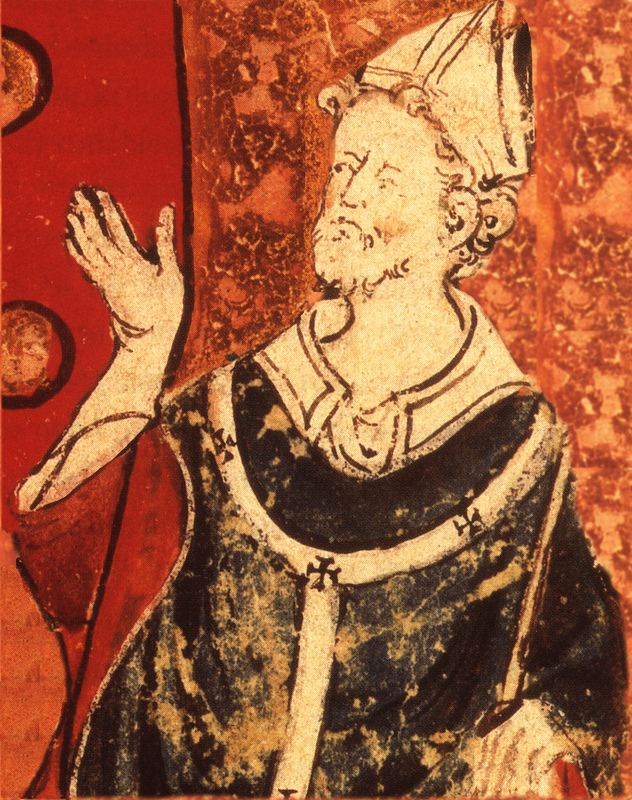 At one point, in 1158, Thomas visited France on Henry’s behalf to demand the hand of the French king’s daughter for the English king’s eldest son (who was only three – though the sought-after bride herself was just a few months old). Thomas took with him a deliberately extravagent cavalcade designed to proclaim the glories of England. It included 250 footmen singing anthems in English, 28 packhorses bearing gold and silver plate, English-bred mastiffs, greyhounds and hawks, grooms holding monkeys dressed in English livery and, according to a widely-quoted passage supposedly from a contemporary chronicler, two chariots “laden solely with iron-bound barrels of ale, decocted from choice, fat grain, as a gift for the French, who wondered at such an invention, a drink most wholesome, clear of all dregs, rivalling wine in colour and surpassing it in flavour”. The passage is significant in suggesting that ale before hops could travel, and could keep the fortnight or more it must have taken in the 12th century to get from England to the French king’s court. It also shows that, on special occasions at least, ale casks were hooped with metal. In 1162 Thomas was appointed by Henry II to be Archbishop of Canterbury, soon after the death of Thomas’s patron Theobald. Undoubtedly Henry made Thomas Archbishop because he wanted an ally in the second most important position in England. However, to Henry’s undoubted amazement and anger, Thomas immediately put himself in opposition to the king’s policies. The two began quarrelling by the following year, and in November 1164 Thomas left the country, after he had been found guilty at a meeting of the great council at Northampton Castle of contempt of royal authority and malfeasance in the chancellor’s office. But anyone who stood up to kings was inevitably popular with the ordinary people, and when the Archbishop returned to England in 1170 he was greeted with acclaim. It was this which probably most got up King Henry’s royal nose, and led to four knights, supposedly acting on what they believed to be the king’s orders, murdering Thomas in the cathedral at Canterbury on December 29 1170. Within three years the former Bramfield brewer was canonised – the pope at Rome naturally wanting to send a message to kings who had archbishops bumped off. Thomas’s shrine at Canterbury, built in the reign of Henry III in 1220, became one of the most popular destinations for pilgrims. Their usual journey started from Southwark, where Becket had delivered a sermon at St Mary’s Priory, now the Cathedral, six days before his death, with the pilgrims retracing the saint’s last trip across Kent. Although one account of Thomas’s life says he had a weak stomach, and could not drink wine or ale, the members of the Brewer’s Company in London claimed their saintly fellow Londoner as the guild’s founder, with roots supposedly in the late 12th century as the “Guild of Our Lady and St Thomas Becket”. When the London brewers received their first charter in the 15th century their organisation was known as the Guild of St Mary and St Thomas the Martyr. In 1468 the brewers were awarded their own armorial bearings. 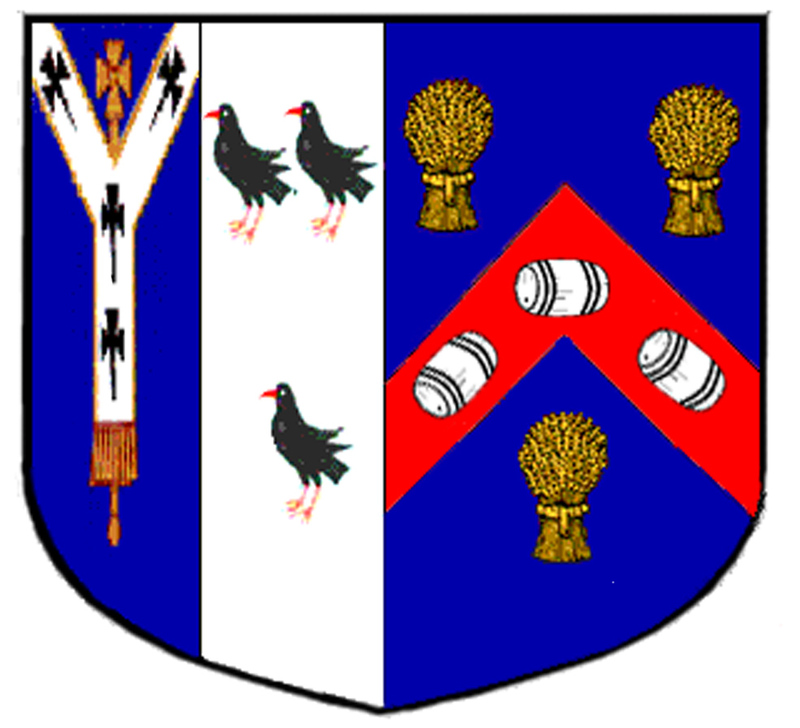 They honoured their supposed links with the saint by impaling the traditional brewer’s three tuns and barley sheafs alongside the armorial insignia of St Thomas, the Becket family’s three ravens or choughs, birds also known as “beckets”, and the arms of the Archbishop of Canterbury. from the servicebooks. He also insisted that all churches dedicated to St Thomas the Martyr had to be renamed. Henry VIII was having his own problems with the Church (and chancellors called Thomas), and did not want any reminders of clerics who had defied kings. The next year, 1539, the City of London, which has St Thomas the Martyr and St Paul as its joint official saints, took the image of the Thomas’s off its seal. The brewers hung on a little longer, but eventually, in 1543/4, decided it would be smart politics to take Becket’s ’s arms off theirs and acquire a new set. In their new arms the brewers still managed to sneak in a subtle reference to Thomas, however. 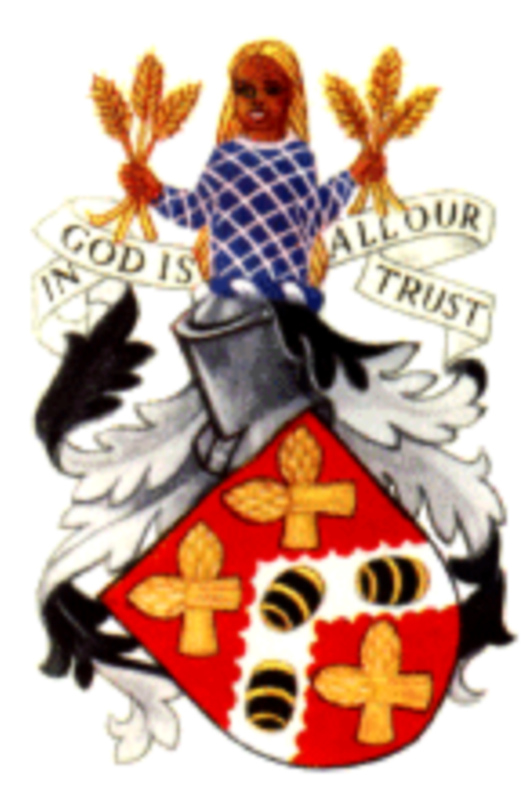 To this day the crest of the Brewers’ Company shows a dark-skinned woman with fair hair, a nod to the (inaccurate) tradition that St Thomas’s mother was a Saracen who had followed his father Gilbert home from the Crusades. It is lucky Bluff King Hal never realised what the brewers and the heralds were up to, in still maintaining a link to a banned saint: Henry VIII had 75,000 people killed during his reign, one estimate says. A few cheeky brewers added to the list would not have worried him. Previous PostWords for beer (2) – was ‘beer’ originally cider?Next PostSo who IS the most popular beer blogger in Britain?